NEW ORLEANS – The Seminoles of Florida State University are the USTFCCCA NCAA Division I Men’s Scholar Team of the Year for the 2010 cross country season as announced Thursday by the U.S. Track & Field and Cross Country Coaches Association (USTFCCCA). Florida State finished as men’s runner-up at the 2010 NCAA Cross Country Championships. Scholar Teams of the year are determined from among those who earned All-Academic status and placed highest as a team at the most recent NCAA Championships. Florida State, coached by Bob Braman, finished as the nation’s runner-up this fall and has amassed a 3.11 cumulative GPA through the last semester. The Seminoles, who entered the NCAA championships as the 11th-ranked team, placed second in the men’s team race to Oklahoma State. In 2010, the Seminoles were the NCAA South Region’s runner-up and ACC Champions. 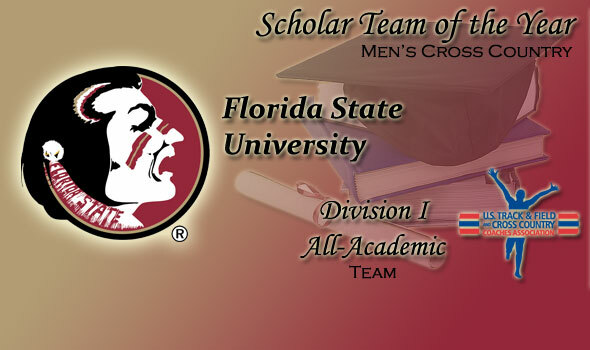 Announced earlier this week, individual All-Academic honors went to Florida State’s Ciaran O’Lionaird and Michael Fout. In addition to the Scholar Team of the Year, the USTFCCCA also announced those men’s teams who earned 2010 Division I All-Academic Cross Country status. A total of 152 institutions represent 31 conferences that compose the group. The Big 12 led all conferences with 10 members earning All-Academic honors and was followed by the Big East which had nine listed. Mississippi Valley State reported the highest cumulative GPA among All-Academic honorees with a 3.62. Southern Illinois followed with a 3.60. Seven of the top ten finishing teams at the 2010 NCAA Cross Country Championships earned All-Academic status. Of the 31 teams that participated in the national final, 20 of those earned All-Academic status. To qualify as a USTFCCCA All-Academic Cross Country Team, the team must have had a cumulative team GPA of 3.00 or better and have started at least five regional at their respective NCAA regional championship.